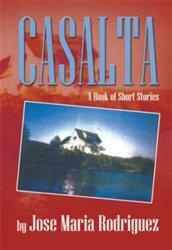 From Jose Maria Rodriguez, World War 2 veteran and author of The Sledgehammer and Anvil, comes Casalta, a unique mixture of six stories that will engage and entertain readers everywhere. In his work, he blends an array of plots dabbed with comedic outlandishness into a hilarious mix of reality and fiction, resulting in several shorts that might be just crazy enough to be true. Among these shorts is an account of a car salesmans nonchalant decision to arrange a pre-planned funeral in the event of his unexpected death, while another tale delves into the mind of a disgruntled dad who longs for revenge and schemes the demise of a mischievous parakeet that wronged him, despite the fact that the bird is beloved by the fathers child. One story chronicles a confounding problem with a car engine, and a very ingenious solution for it involving the use of a douche bag, much to the amusement of a group of observing high school students. The stories in Casalta inhabit the boundary between fact and fiction, and are just outrageous enough to keep readers guessing as to whether they really happened. With his creativity and imagination, Rodriguez presents a cool six-pack of charming yarns that will keep readers entertained through their days. Jose Maria Rodriguez enlisted in what was the Army Air Force in 1943. He was disqualified for pilot training because of his poor depth perception, trained in radar maintenance and operation for weather observation, and served in the weather stations of Saipan and Okinawa, where he was at the end of WWII. He married in 1948, went to California Polytechnic State College under the GI Bill, graduated in 1951 with a BA in physics, went to work for Douglas Aircraft the same year as an industry-classified engineer, and retired in 1978. His love for science is equaled by his love for poetry. He has published a book on poetry titled The Sledgehammer and Anvil. He lives in California and has a summerhouse in the state of Washington, where he does some of his writing and graphics.